“Reminiscent of Stephen King’s fiction handbook On Writing, this book is an…indispensable nonfiction guidebook from an authority who knows his subject from cover to cover”(Kirkus Reviews). From rags-to-riches-to-rags tell-alls to personal health sagas to literary journalism everyone seems to want to try their hand at creative nonfiction. 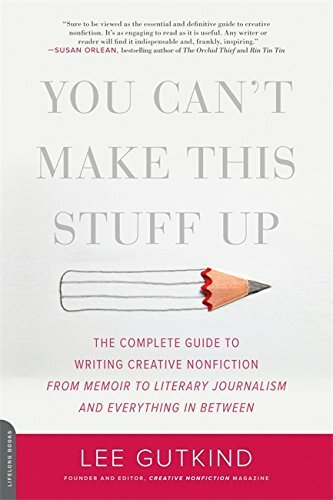 Now, Lee Gutkind, the go-to expert for all things creative nonfiction, taps into one of the fastest-growing genres with this new writing guide. Frank and to-the-point, with depth and clarity, Gutkind describes and illustrates each and every aspect of the genre, from defining a concept and establishing a writing process to the final product. Offering new ways of understanding genre and invaluable tools for writers to learn and experiment with, You Can’t Make This Stuff Up allows writers of all skill levels to thoroughly expand and stylize their work.